Johnson, W.R. (1993). Horace and the dialectic of freedom : readings in Epistles 1. Ithaca: Cornell University Press. ISBN 0-8014-2868-8. Lyne, R.O.A.M. (1995). Horace : behind the public poetry. New Haven: Yale Univ. Press. ISBN 0-300-06322-9. Putnam, Michael C.J. (1986). Artifices of eternity : Horace's fourth book of Odes. Ithaca, NY: Cornell University Press. ISBN 0-8014-1852-6. Rudd, Niall, ed. (1993). 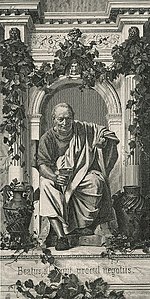 Horace 2000: a celebration : essays for the bimillennium. Ann Arbor: Univ. of Michigan Press. ISBN 0-472-10490-X. Sydenham, Colin (2005). Horace The Odes. Duckworth. Wikisource has the text of the 1911 Encyclopædia Britannica article Horace. വിക്കിമീഡിയ കോമൺസിലെ Quintus Horatius Flaccus എന്ന വർഗ്ഗത്തിൽ ഇതുമായി ബന്ധപ്പെട്ട കൂടുതൽ പ്രമാണങ്ങൾ ലഭ്യമാണ്.